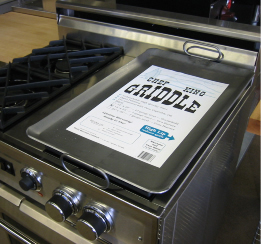 Compatible with Gas and Electric powered cooktops. NSF certified for commercial restaurant use! 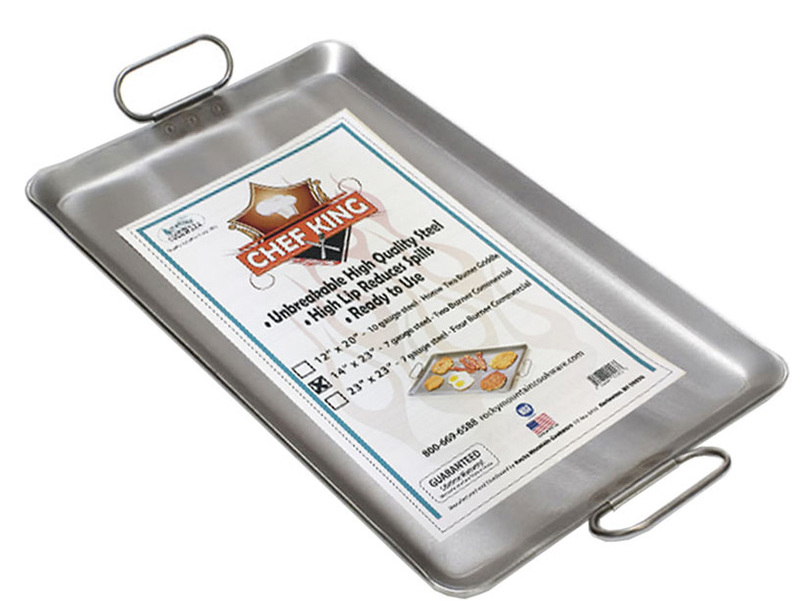 Made from unbreakable, high quality steel, Rocky Mountain Cookware griddles and broilers are hand polished and pre-seasoned. All Rocky Mountain griddles have the same great qualities of even heating, no warpage under 600° Fahrenheit, long service and a Lifetime Warranty. Orders may be placed by phone (1-877-386-7766), online shopping cart or secure order form. Please contact us if you need assistance or a shipping quote 1-877-DVORSON. 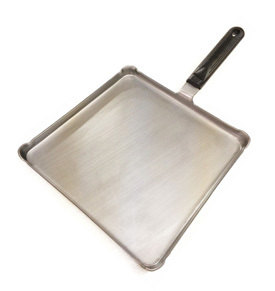 Our most popular add-on-griddle model. 2-burner Pancake style. Compatible with gas and electric powered cooktops. Made of unbreakable pure cold-rolled steel. Lifetime Warranty. Made in USA. Now with Free Shipping on this model! 4-burner Pancake style. Compatible with gas and electric powered cooktops. 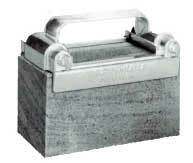 Made of unbreakable pure cold-rolled steel. Lifetime Warranty. Made in USA. Single burner griddle with 4 easy-pour corners. Featuring a detachable handle. A handy item in the kitchen. 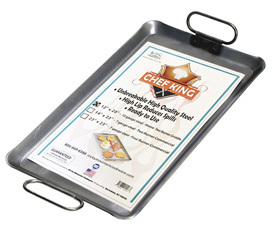 Compatible with gas and electric powered cooktops. Lifetime Warranty. Made in USA. 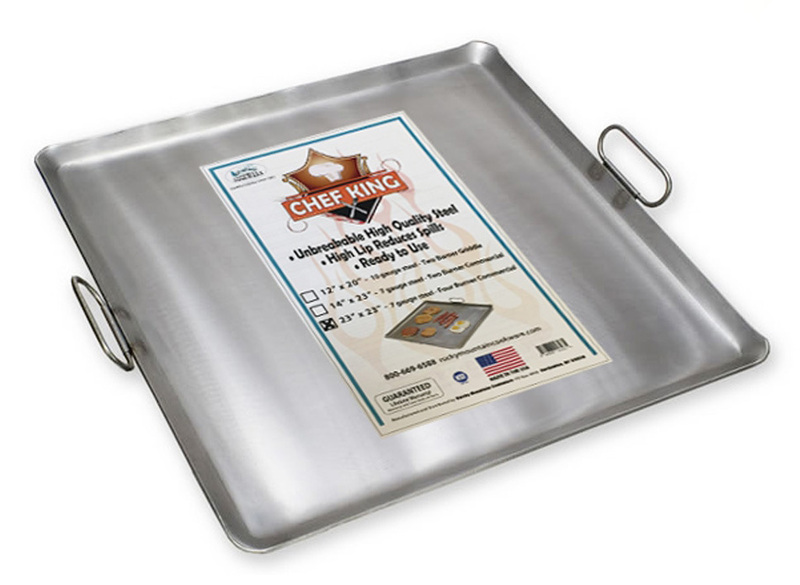 This 12" x 20" Sized Griddle is Great for Home Ranges. Our most popular griddle for Professional Ranges! Orders may be placed by phone (1-877-386-7766), online shopping cart, or secure order form. Volcanic pumice abrasive grill cleaner.